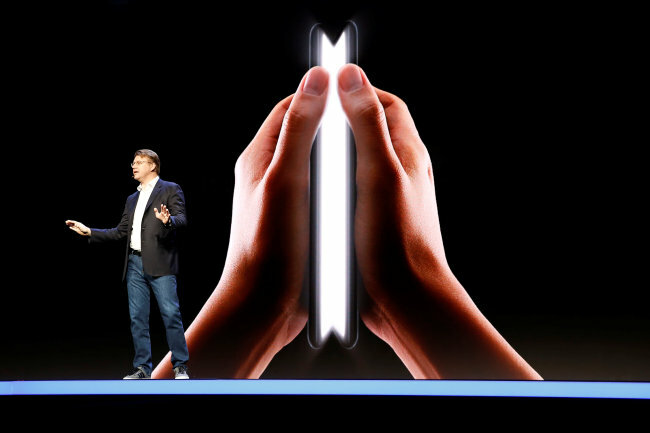 SAN FRANCISCO -- Samsung Electronics Co. on Wednesday showcased its upcoming smartphone with a foldable display slated to be released in the early part of 2019. The infinity display is expected to be employed on the company's upcoming high-end smartphones. "Is your app ready for foldable phones?" said Park Ji-sun, Samsung's senior engineer, adding that the "in-folding" type display has a pixel density of 420 dots per inch. "The cover display is slightly smaller than displays of recent smartphones on the market, but all of the applications can be used just like on the main display," Park stressed. Samsung Electronics also announced a major overhaul to the company's Android interface, called One UI.